When Elma Ultrasonic develops a product they strive to exceed both the practical and the aesthetic needs of their customer. The company began its journey as a small watch cleaner, introducing ultrasonic technology to the watch industry in the 1960’s. 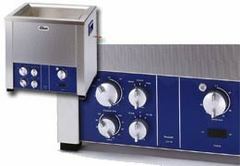 In business for over 50 years, Elmasonic is an innovator in the ultrasonic cleaner industry. Pairing the technological advances and modern designs that Germany is renowned for, Elma Ultrasonic continues to create highly efficient instruments without compromising style. Elma offers a full range of products that will meet all of your ultrasonic needs that combine leading edge technology, attractive and intelligent design, and the highest manufacturing quality. German engineered and designed, Elmasonic products beautifully pair form and function. Whether you’re seeking a multifunctional system such as the S-line or the efficient modern E Plus line, Elma has the unique product to fit your cleaning needs. 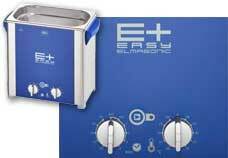 The Elmasonic E Plus thoroughly cleans a broad range of parts made of metal, glass, or plastic. Sweep mode assures fast and uniform cleaning. 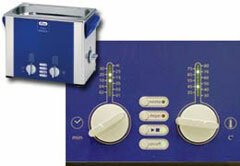 Use Pulse mode to remove stubborn contaminants, degas fresh cleaning solutions or to mix, dissolve and disperse samples. An economical product for shop or lab. The Elmasonic S offers powerful Sweep mode cleaning. Select from two additional ultrasonic modes optimized for sample preparation and solvent degassing. Very wide choice of tank sizes, from ¼ gallon to 24 gallons. The Elmasonic P has an incredible amount of ultrasonic power for the fastest and most thorough cleaning and sample preparation. You have total control of the ultrasonic process: choose frequency, power level, time, temperature, ultrasonic mode. Select operation at 80 kHz for virtually silent cleaning of fragile instruments and even fine capillary tubes. 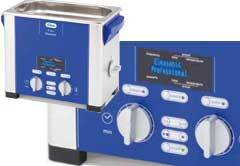 The versatile ultrasonic cleaner preferred by R&D laboratories. The heavy-duty TI-H units are designed for small scale industrial use. Two ultrasonic frequencies for gentle and intense cleaning, adjustable power and three ultrasonic modes offer unprecedented process control. Ideal for 8-hour shift operation.